Fred Hembeck gave me this. I don’t remember what the occasion was. Inks by star Joe Rubenstein and colors by the amazing Marie Severin. This, I believe, is Fred’s first letter to me. I think this was done before he was being published by the Comic Buyer’s Guide and Marvel. Cool, huh? Someone brought up Marvel photo covers a while ago and I mentioned that we had done one for Dazzler early on. I found one of the test shots taken during the shoot. The model was a young woman from Canada. This was probably her only job ever playing a super heroine. LOL I'm still living down my modelling stint as Captain America on the cover of Marvel Team-Up #128. "@Darryn, we should be greatful there was no low budget Spider-Man film from the 80s in the hall of shame with Captain America and the Fantastic Four." The growth of the Direct Market made selling reprints of material of interest to collectors viable, and eventually selling trade paperbacks possible. Before, any book-format item had to go through a trade book publisher, and economically, it was a non-starter. Just remembered that Marvel began publishing their own trade paperbacks on your watch. This followed a year or so of slick annual-sized reprints of some of Marvel's biggest stories: Kree/Skrull, Steranko's S.H.I.E.L.D. and Cap, Adams' X-Men, etc. Did the latter lead to the former? Are there any interesting details to share about the beginning of this program? It's safe to say that Marvel was transformed forever by this initiative, so the origins of same would be extremely interesting! I don't think so. I never saw a check or a buck forked over. "I was always kind of one of the guys. Now, Jim Shooter hired me away from Warren. When Shooter asked me [to come to Marvel], it looked like Warren was less interested in the comics and had other interests and it looked like time to move to Marvel, so I did. Shooter hired several women, as editors, I think I'm the only one who stuck ? I mean it was a tough room to be in, but Shooter was much more open than many of the guys are today, even. Though I'll probably get in trouble for saying that…"
I had no idea most of these various controversies even existed, but I wish I could time-travel to one of those writer lunches around the block on a Friday night, or even one of those volleyball or softball games. Those Bullpen Bulletin style stories, made of lost jokes and conversations, shaped a dream of working and conceptualizing and socializing with creative people that is truly just beginning to come true. I've always believed in that sense of camaraderie, esprit de corps, and taken it best I could in every work environment I've ever had, knowing it's the perk that easily doubles the pay! @Darryn, we should be greatful there was no low budget Spider-Man film from the 80s in the hall of shame with Captain America and the Fantastic Four. This may be a silly question, but I'm curious: when characters were licensed to people for a dollar, did a check for one dollar actually change hands? I can imagine the accounting and legal departments wanting to keep their i's dotted and their t's crossed. Pariah, If this was the cover you were talking about, the guy in question was supposed to be Spiderman in the movie, back when Tobe Hopper was supposed to be directing for Canon. I miss formetti, not really having seen any since the early 80's. It used to pop up in few different stories serialized weekly comic book series we got from the UK. The formetti covers were eye catching and interesting for sure, i liked the one with spider-man unmasked and has his Spidey shirt tucked into a pair of jeans. The settings for the blog only allow a "yes, show the mobile template" or "No, don't…", and I don't see a way to edit the template or allow the user to choose, which would be nice. If you have any advice please email me. I would love to make the blog better. I will also try to look up some information about the mobile template. Of course that goes for anyone. If you have suggestions please let me know! I don't have a copy. If John says he didn't draw a cover, well, he should know, I guess. In the absence of documentation, the word of the artist himself trumps my memory. I love your blog probably more than any comics on the stands today. However, I hate the new mobile layout. It won't allow my to zoom in or out, preventing me frombeing able to read anything in the images of letters or comics pages you post while viewing the site on my phone. Thus, I need to use the View Web Version link instead, which is better for reading, but slower to load. You (or the webmaster – that's jayjay right?) might consider adjusting the template to allow images in the mobile version to be clicked and loaded in their own window, which would allow someone on a phone to zoom in on the pages as they desire. Just a small tip from a fellow webmaster, but a minor complaint. Your site is the greatest thing on all the internets. ASM #262 is one of my least favorite covers. On the other hand, I had never seen the Spider-Woman photo cover before and that doesn't look half bad. 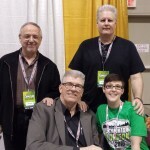 Dear Mr. Shooter – I LOVE your blog and would love to see you back at Marvel. Your stories are an absolute treat every day. Over at the John Byrne forum, he states that he has no recollection of the Superman cover. Can you provide an image or additional details? Here's a link to a gallery of some Marvel 80s photo covers. Not sure if this is all of them, although Fantastic Four #268 should be added to the list too. I only recently discovered this blog and am really enjoying it. I became a Marvel reader in the mid-80s, and it's interesting to learn more about the company and the personalities behind it at that time. I just realized how prescient it was for Fred Hembeck to draw himself as a bearded Ghost Rider. The current Ghost Rider series involves a Nicaraguan woman named Alejandra becoming the new Spirit of Vengeance. During May 12th's Next Big Thing conference call, Matthew Clarke said "I'm showing a little bit of her hair. Subtle hints. She'll eventually have long hair. Then she is wearing a tight leather bodysuit, or as I've put in my notes, a tight rubber bodysuit." Adam Kubert's covers for Ghost Rider #2-4 all feature Alejandra's hair extending beyond her shoulders while her skull is on fire. So Fred was decades ahead of his time giving Ghost Rider hair. Awesome site, actually – I clicked for the covers and stayed for the "awesome." It's funny you guys brought up Stargrave. Like Mr. Netzer alluded to in an earlier post: synchronicity! Just yesterday I found a copy of Superboy and the Legion #224 and (after checking to ensure it was one of Jim's plots/scripts) picked it up. I know virtually nothing about the Legion, but, as with everything in this blog, hearing it discussed and reading the behind-the-scenes stuff has piqued my interest. The Amazing Spider-Man cover was on issue #262. March, 1985. Can any of you guys with apparently encyclopedic knowledge and uncanny memories list the photo covers? I can't. As I recall, those covers didn't have noticeable impact on sales. We did them because they were fun to do, mostly. Also, Gruenwald and his hench-people who did the Spider-Woman cover talked a very attractive secretary in the licensing department upstairs into posing wearing the SW costume Marvel had for its promotional "character personal appearance program." So…there might have been other motives at work besides experimenting with covers. The mask that came with the costume didn't look right, so Gruenwald or one of his catspaws painted the mask onto the young woman's face using lipstick! I wasn't there for this photographic escapade, but I heard all about it later. I am currently rereading Secrets Wars in honor of Jim's great blog, incase an in depth blog is ever done on it. Funny thing, when it came out in the mid 80's, I considered it about the best superhero stuff I'd ever read. This was when getting all the heroes together for an adventure wasn't beaten into the ground! I read it again about 6 years ago and found it underwhelming and "dated", which is a word that I hate seeing used. I had seen this criticism labeled against it many times, so I was surprised that I got the same vibe. Well, I am about half way through it, and for whatever reason, it holds up great this time, and I am being reminded of why I loved it so much when it first came out. Maybe my ever growing disdain for what Marvel comics has become, and my dislike of many of the arrogant hack writers with a sense of entitlement that have taken over the industry is what brought me back to what comics should be like. Sorry to post this unrelated comment here, but I had to get that out of my system! I liked the roast, although I think the jokes would have worked better if Hembeck had drawn the whole thing. I particularly liked Howard the Duck's line, "Man-thing told me whoever knows laughter will burn at the man-thing's touch…looks like everyone here is safe." I found it surprising that Marvel included a Fred Hembeck parody of Todd McFarlane back in 2009 when Spider-Man: Torment was reprinted as Marvel Premiere Classic Volume Volume 27. I cooked that up with Roger Stern, who has a much better memory than I do. And, by the way, Dave Cockrum, with whom I shared an apartment in Bellerose kibbitzed, I think. I'll try to have a chat with Rog soon and see if we can, between us (mostly him, probably) reconstruct the construct. Stay tuned. 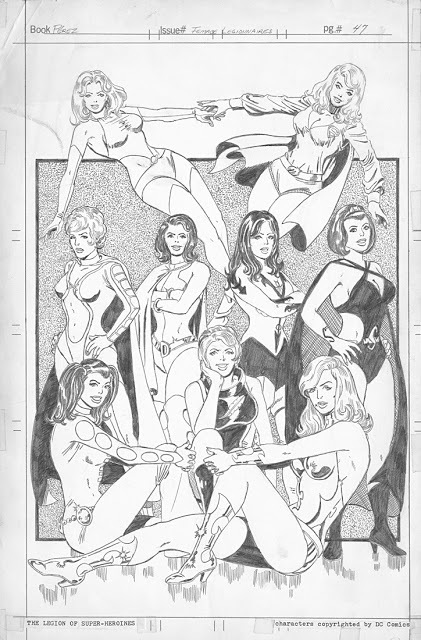 I distinctly recall that Dazzler cover, and if I remember right, you also did photo covers for one of the Spider-Man books, as well as Spider-Woman (which included the added bonus of having the Werewolf by Night on it, too). They were all incredibly eye-catching, but I guess they didn't translate into particularly higher sales, since the experiment wasn't repeated. Would that be correct, Jim? P.S. I'd happily 'settle' for Perez doing a Supergirl book…and with Kara Zor-El wearing her definitive uniform, the 70s blouse model. 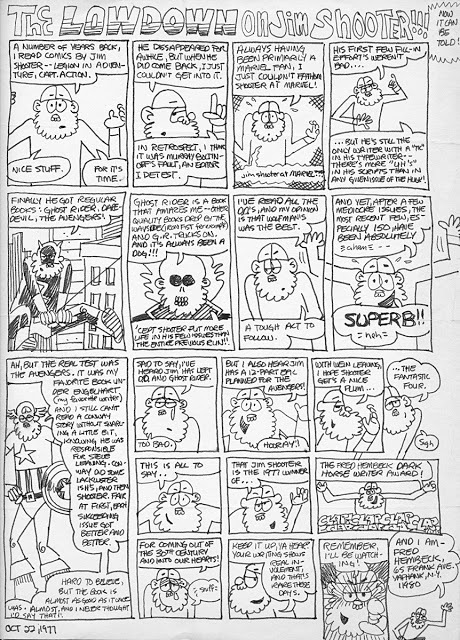 I like Hembeck's one page strips, but when I first read his Fantastic Four Roast back in the early '80s, I almost lost the will to live. What a turgid, tortuous ordeal – could well be the worst comic ever printed. Different artists' artwork was too sore on the eyes (no doubt on account of the script being 'too busy'), and the relentless 'one-liners' were, well – relentless. (Not to mention contrived and unfunny.) I read it again a few months ago to see if it was as bad as I remembered – it was worse. Yes, I was also going to ask you about your plans for Stargrave. A comment above makes me wonder what was your plan for the Stargrave saga, the last story you wrote for Superboy/LSH in 1976. Anything you'd like to share? I noticed the colors were reversed on Superman's chest emblem as well. It reminds me of Barack Obama as Superman introduced in Final Crisis #7 ("New Heaven, New Earth"). The yellow lining is absent from his boots though. In 2009, Grant Morrison said "I hope to do more things with the Obama character next year." So far, that hasn't happened but I assume he'll be prominent in The Multiversity project. The Legion ladies never looked better than in their 70's outfits! =) Never knew about George's book until now, though. Fred is of course, one of a kind in the biz. A complete body of work going back to his fan days would take up volumes! Lastly, that's a great pic of Dazzler up there. All she needs is her parted, feathered look and she'd be a dead ringer for Ali. Fred Hembeck's one of the nicest guys in comics…and his Omnibus is awesome. I forgot to mention that Fred Hembeck had the foresight to give you the "Fred Hembeck Dark Horse Award" decades before you wrote for Dark Horse … and long before Dark Horse even existed! That Legion pin-up makes me wonder what a Shooter-Pérez Legion book would have been like. Imagine the LSH vs. Korvac a millennium from now. I wonder why Marie Severin decided to change Superman's colors a bit. Not that I mind at all. 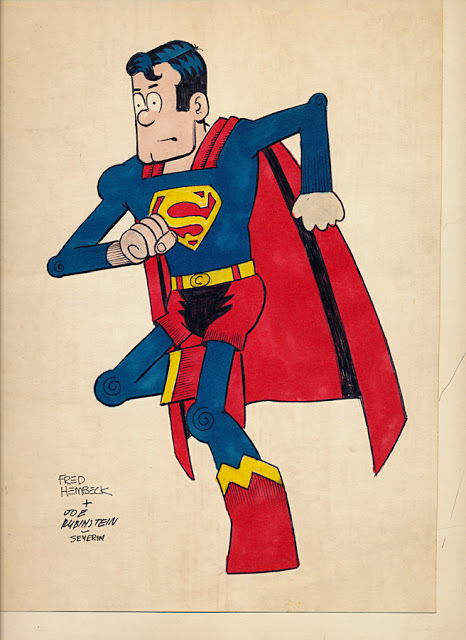 I'd buy a Hembeck/Rubinstein/Severin Superman! I remember that Dazzler cover! This looks like the source photo before the background was blacked out. Thanks for unearthing these items! Only the Shadow knows what else you have … and maybe JayJay! Your storage area must be like a clown car- you just keep pulling out more and more. And all of us who remember reading your legion stuff on the first go round really appreciate you sharing. And Fred must have been strange from an early age.